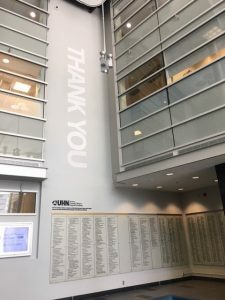 In 2018 we supported Louise McCathie to visit Toronto and learn from four Hospital Foundations. Now, Louise shares what she learned and how she’s been putting it into action…. As I’m finalising plans and budgets for the years ahead, it feels like the opportune moment to grab a cuppa and reflect on what I took away from my trip to Toronto in the Summer. On opening up my notebook I’m flicking through the pages to check that I have applied all the abundance of insights I gained thanks to the generosity of the four Hospital Foundations I visited. Have I captured every moment when I said “we could do that”, “why don’t we do that”, “we should be doing that” and “I’d love to do that”? Whilst going through my ‘To do List’ and feeling a great sense of accomplishment as I draw a line through each action I’ve completed (yes, I’m one of those people…), there is one task that’s still outstanding and that’s to share my learning’s far and wide, beyond my organisation. It was a commitment I made when I applied to the Tony Elischer Foundation for this amazing opportunity, so that’s what brings me here, to my first blog and I hope that for at least one of you it will spark an idea or motivate you to do something that’s still sitting on your list. 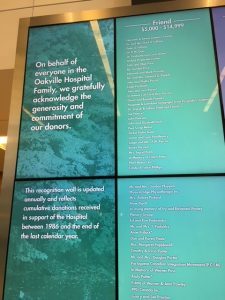 So why did I want to visit Hospital Foundations in Toronto? In the last 20 years the NHS charity sector has grown immensely. Some view it as a success story but myself and others believe it’s actually a sleeping giant. The ambition of NHS charities is growing and the bigger collective role they can play in society is starting to become recognised. Coupled with that my own role had evolved, in February 2017, Birmingham Children’s Hospital and Birmingham Women’s Hospital came together as one united NHS Foundation Trust – the first of its kind in the UK. This was a new chapter in our charity’s history, one that would require me to look further afield and refresh our ways of thinking and doing. I knew we would need to position ourselves as both a ‘global’ and ‘local’ leader of healthcare – something that many health foundations in Canada have achieved with fantastic results. And thankfully the trustees at the Tony Elischer Foundation supported me on this incredible development opportunity and coupled me with my fantastic mentoring partner Blakely. Well in addition to developing an addiction to Fraktals (pieces of Canadian maple syrup buttercrunch covered in Belgian chocolate!!! ), I also took away a clear understanding of why Canadian philanthropy is so successful. Whilst there are several ideas that I’ll aim to share with you in future posts (if anyone dares to read another after you’ve endured this one...), the biggest take away and important reminder I gained was to love and thank your donors not just in the moment but for life! I appreciate those reading will now be shouting “IS THAT IT??? ?’ – I’m sorry it’s so obvious but it really is that simple as to why their fundraising is flourishing. Each of the charities I visited truly recognised the importance of the value a donor could bring to their organisation over a lifetime and they celebrated it. In fact they shouted about it. As you’ll see from the photo’s, as soon as you walked into any foyer, it was there in fully glory ‘Thank You’. In all honesty I feel a bit embarrassed as I thought I’d come away with that ‘big, new, shiny idea’ that would help me quadruple our income. Naively I felt we thanked and celebrated our supporters’ achievements well but sometimes you have to step outside of your own organisation to truly see how well you are doing. The difference I witnessed was that commitments for the future were celebrated just as much as donations received. How beautiful that those planning on reaching milestones for the future or an individual planning to leave a legacy got to be celebrated with as much fanfare as winning a partnership. I think we can all be guilty of sometimes just focussing on the here and now, maybe some of our day to day processes and measures amplify that but I’ve really reflected on how we can celebrate commitments better. Do we sometimes overlook the most loyal of supporters who give year on year, our tribe, who will be there with us through the tough times and do we get drawn into offering a much bigger celebration to the one off partnerships, which is in a moment of time? Naturally it goes without saying that all should be celebrated in their own personalised way but I suppose we should start to value all our supporter relationships like a marriage. Let’s not just have a fantastic wedding day, let’s make sure we celebrate every anniversary, birthday and achievement. The only negative gain might be on my waist band as this might naturally mean more cake, or maybe I can introduce Fraktals!!! Tony Elischer Foundation is very grateful for the amazing support provided by Kimberley Blease and the Blakely Inc. team to enable this project to happen. We are also hugely appreciative to Sick Kids Foundation, Toronto General & Western Hospital Foundation, St Michaels Hospital Foundation and Oakville Hospital Foundation for providing this opportunity.